const char * CN_WAITING = "(waiting)"
const char * CN_NOBODY = "(nobody)"
const char * CN_NONE = "(none)"
const char * CN_HIPPOS = "(hippos)"
A hierarchical cache of first and last names queried based on UUID. Definition at line 184 of file llcachename.cpp. Definition at line 187 of file llcachename.cpp. Definition at line 188 of file llcachename.cpp. Definition at line 186 of file llcachename.cpp. Definition at line 185 of file llcachename.cpp. Definition at line 56 of file llcachename.cpp. Referenced by LLCacheName::exportFile(), and LLCacheName::importFile(). const char* CN_HIPPOS = "(hippos)"
Definition at line 48 of file llcachename.cpp. const char* CN_NOBODY = "(nobody)"
Definition at line 46 of file llcachename.cpp. Referenced by LLCacheName::get(), and LLCacheName::getName(). 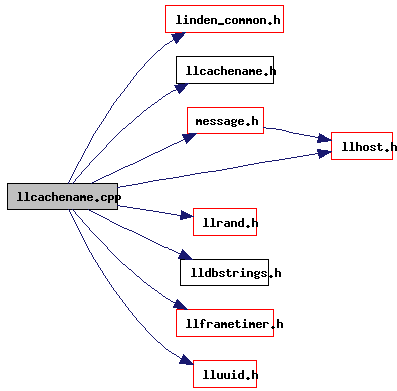 const char* CN_NONE = "(none)"
Definition at line 47 of file llcachename.cpp. const char* CN_WAITING = "(waiting)"
Definition at line 45 of file llcachename.cpp. Referenced by LLCacheName::getDefaultName(), LLCacheName::getGroupName(), and LLCacheName::getName(). Definition at line 59 of file llcachename.cpp. Referenced by LLFloaterNewIM::addAgent(), LLAvatarTracker::addBuddyList(), LLNameListCtrl::addElement(), LLNameListCtrl::addGroupNameItem(), LLNameListCtrl::addNameItem(), LLPanelLandObjects::callbackReturnGroupObjects(), LLPanelLandObjects::callbackReturnOwnerObjects(), cleanup_app(), LLViewerParcelMgr::deedLandToGroup(), LLPanelEvent::draw(), LLFloaterTrustNetRate::draw(), LLFloaterPay::finishPayUI(), LLFloaterChat::getAvatarName(), LLTrustNet::getScoreData(), idle_network(), idle_startup(), inventory_offer_callback(), inventory_offer_handler(), LLIMMgr::inviteToSession(), load_name_cache(), load_region_name_cache(), LLSpeaker::lookupName(), LLIMMgr::noteOfflineUsers(), LLPanelFriends::onClickIM(), LLPanelFriends::onClickModifyStatus(), LLPanelFriends::onClickRemove(), LLPanelLandObjects::onClickReturnGroupObjects(), LLPanelLandObjects::onClickReturnOtherObjects(), LLPanelLandObjects::onClickReturnOwnerObjects(), LLDispatchEstateUpdateInfo::operator()(), LLCollectAllBuddies::operator()(), LLCollectOnlineBuddies::operator()(), LLCollectMappableBuddies::operator()(), process_agent_movement_complete(), process_covenant_reply(), process_load_url(), process_mean_collision_alert_message(), LLAvatarTracker::processChange(), LLAvatarTracker::processNotify(), LLSelectMgr::processObjectPropertiesFamily(), LLStatusBar::refresh(), LLPanelLandAccess::refresh(), LLFloaterInspect::refresh(), LLFloaterAvatarTextures::refresh(), LLFloaterProperties::refreshFromItem(), LLPanelLandAccess::refreshNames(), LLPanelLandGeneral::refreshNames(), save_name_cache(), save_region_name_cache(), LLSelectMgr::selectGetCreator(), LLSelectMgr::selectGetLastOwner(), LLSelectMgr::selectGetOwner(), LLNameEditor::setNameID(), LLNameBox::setNameID(), LLFloaterBuyContents::show(), LLFloaterGroupInfo::showFromUUID(), LLFloaterBuyLandUI::soleInstance(), LLAvatarOwnedEmitter::update(), LLPanelGroupMembersSubTab::updateMembers(), LLFloaterBuyLandUI::updateNames(), LLFloaterSellLandUI::updateParcelInfo(), LLPanelAvatarSecondLife::updatePartnerName(), LLHoverView::updateText(), LLAvatarOwnedEmitter::~LLAvatarOwnedEmitter(), and LLFloaterPay::~LLFloaterPay(). Definition at line 49 of file llcachename.cpp. Definition at line 53 of file llcachename.cpp. Referenced by LLCacheName::deleteEntriesOlderThan(), and LLCacheName::Impl::isRequestPending().